Speed sign mounting brackets that are designed to make installation & removal a quick, straightforward task. Created specifically for our speed sign products these brackets are manufactured in-house from a blend of non ferrous aluminium & high strength stainless steel. Supplied with top quality British manufactured torque bands these brackets give you the freedom & flexibility you need when managing your traffic enforcement program. A lightweight post base station, a pre installed metal "claw". These are the two basic components which make up our easy to use mounting system. Manufactured from durable aluminium these simple components allow you to install & reposition your speed sign system without any special tools, without any extra labour. 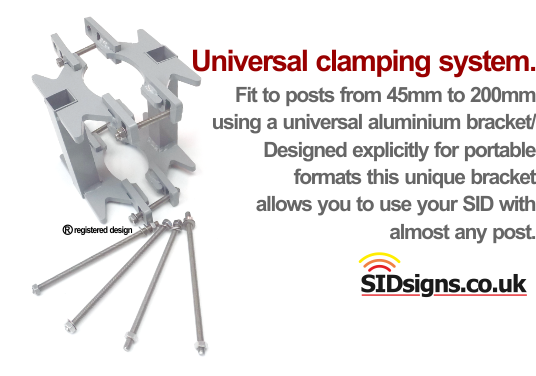 Take a lightweight, compact base and clamp it to your post using the heavy duty, British made expandable clamping straps which come as part of the installation kit. Once the base station is securely attached all you need to do is lift your sign up and drop it onto the "hook". It's that simple, it's that easy. These clever brackets allow us to provide you with a convenient modular approach which makes everything so easy. Foe example. the post shown above is bracketed for a battery powered speed sign. When installing you simply strap your base stations onto the post. Lift the sign up on one side and it will drop straight over the base and is now secure. Take the battery cabinet; lift this onto the other base station and drop it one, this is now also secure. To power your sign simply drop the battery into the cabinet; a job which is make easy thanks to the unique stainless steel carrying caddy fitted to your battery and the large door on the cabinet. Click together two push fit cable connectors and your sign is installed. If you want to secure everything against theft that's easy too. Each bracket is designed to allow a padlock to be looped through both parts; you can drop everything on but the padlock stops anything from being lifted off. Are you planning to buy one radar speed sign which you will rotate around different locations? If you want to use a multi site setup that's not a problem. Let us know how many posts you'll be using and we'll supply you with enough base stations for each one. Once you've fitted this part of the bracket system to all of your posts it's then a simple case of lifting off and dropping back on. You won't need any tools, you won't have to allocate two people to the task of rotating your signs through different locations. Don't forget, we make affordable repeater signs which you can use to place a reminder sign in each empty base station, you can see one of these signs being dropped into position in the photo above. A quick, cost effective way to multiply your speed awareness message. If quick release mountings don't suit your requirements you can have a more conventional system based on industry standard channel & clamp components. Specially designed lightweight aluminium extrusions permanently fixed to the back of your speed sign & it's component parts. Quality, high strength stainless steel post clamps supplied with the correct in-rail M8 bolts. A proven system which is perfect for permanent installation of all kinds of traffic sign; we even supply posts so all your bases are covered.